Why is the app asking for my location? Location ‘permission’ is a requirement for Bluetooth LE and is necessary in order for our app to connect to your spirometer, oximeter and other devices. No data regarding your location is recorded or stored by the Project Breathe app. 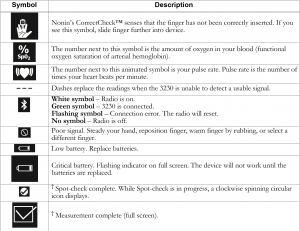 What do the icons on my oximeter mean? If the image displayed on your device is not found in the above image, you can obtain further information in the online manual, here. Why is my app stuck ‘connecting’ when trying to record a bluetooth measurement? If the app gets stuck in a ‘connecting’ state, try closing the capture page and retrying. If this doesn’t help, close the capture page before turning your spirometer or oximeter off and on again, then trying again to record a measurement. If you are still unable to record a measurement, turn the phone’s Bluetooth feature off and back on again. Try using the phone’s Bluetooth settings page to search for your devices and create a pairing with it. Finally, restart Project Breathe app, you should now be able to record the measurement.